Pocher K59 Ferrari Testarossa Targa 1/8 scale model kit! 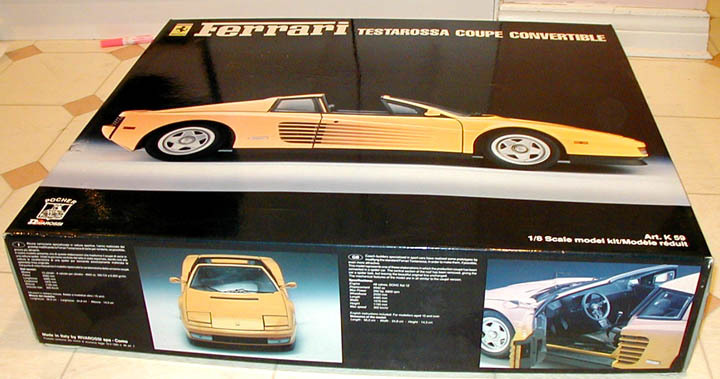 This is the rarest Pocher Ferrari Testarossa kit. I have no idea how many of these were produced but, after having sold several hundred Pocher kits I only ever saw this one. As you can see from the picture, it was obtained directly from the Pocher factory in 2001. The kit was new and untouched when I received it. Sadly, it survived a mild flood and the box you see in the picture was virtually destroyed. I will send it to the eventual buyer of this kit anyway, but it is quite unusable. The parts, of course, are unstarted and all still in their original packaging.